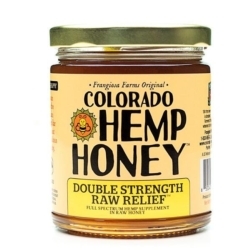 Enjoy our latest creation of pure and raw honey and double the full spectrum hemp extract and naturally occurring CBD in our 12 oz jar of Double Strength Raw Relief. • We donate 10 cents of every jar purchase to Veterans to Farmers. • Each 12 oz jar contains 2000 mg of full spectrum hemp extract. • 12oz (340ml) jar: ~68 servings per jar at 5 ml per serving (approximately 1 tsp). • One serving contains 30 mg hemp extract. Wait 30 minutes before consuming another serving to gauge how your body metabolizes the cannabinoids.